Looking for a Used Land Cruiser in your area? CarGurus has 1,361 nationwide Land Cruiser listings starting at $8,995. The Toyota Land Cruiser is one of the oldest and biggest traditional SUVs available. Last redesigned in 2008 and refreshed in 2016, it sails along for another year without a significant update. Toyota is celebrating the Land Cruiser’s 60+ years on the market by introducing the limited 2020 Heritage Edition. The massive Land Cruiser has a dominating presence and a traditional design brought up to date by features such as LED lighting. The Heritage Edition offers some nice exterior upgrades such as bronze BBS wheels, darkened headlight housings flanking a black-accented grille, dark chrome trim, and vintage-style badging. The Land Cruiser’s beefy powertrain carries over unchanged, a 5.7-liter V8 engine and 8-speed automatic transmission, good for 381 horsepower and 401 pound-feet of torque. A full-time 4-wheel-drive (4WD) system comes standard, with extra capability for off-roading thanks to features like downhill-assist control, hill start assist, crawl control, off-road turn assist, and multi-terrain selectable driving modes, all of which come standard. While 2020 fuel-economy ratings aren’t available, we expect them to fall in line with the 2019’s 13 mpg city, 18 highway, and 15 combined. The rugged and handsome cabin features three standard rows of seating, and standard features include leather upholstery, heated and cooled front seats, heated and reclining second-row seats, a heated steering wheel, keyless entry, push-button start, a moonroof, and a cooled center console. The Heritage Edition mixes it up a bit, nixing the third row and cooled center console in favor of more cargo space and adding bronze contrast stitching on black leather. The standard setup is a 9-inch touchscreen with a 14-speaker JBL audio system, CD player, AM/FM radio, SiriusXM satellite radio, HD Radio, iPod input, Bluetooth, navigation, voice recognition, Siri Eyes Free, and wireless device charging. 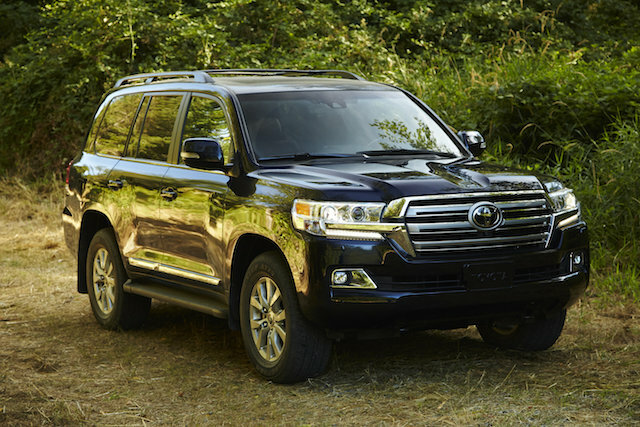 The Land Cruiser hasn’t been crash-tested by the National Highway Traffic Safety Administration (NHTSA) or Insurance Institute for Highway Safety (IIHS). Safety features include a reversing camera, a multi-view multi-terrain monitor, front and rear parking sensors, blind-spot monitoring, rear cross-traffic alert, and trailer-sway control. Toyota also includes the Safety Sense P package, with automatic high beams, radar cruise control, lane-departure alert with sway warning, and pre-collision assistance with pedestrian detection. The Safety Connect telematics system, which is complimentary for the first three years, includes emergency assistance, stolen vehicle tracking, and automatic-collision notification. The Toyota Land Cruiser isn’t as fancy as many of its competitors, like the Infiniti QX80, Lexus LX, Lincoln Navigator, and Cadillac Escalade, but it’s certainly as capable. If you’re shopping in this category, be sure to check out the Heritage Edition for something a little different. What's your take on the 2020 Toyota Land Cruiser? Have you driven a 2020 Toyota Land Cruiser?